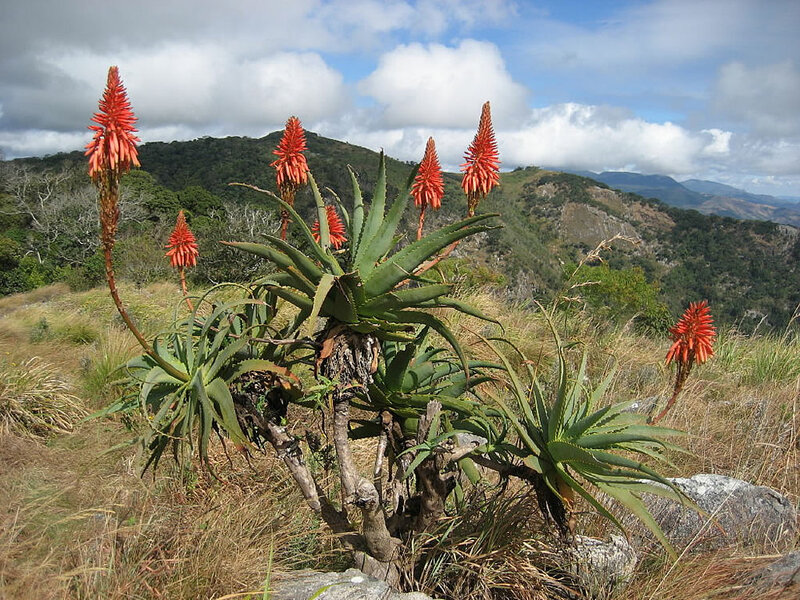 Distribution and habitat: Aloe arborescens is a species of flowering succulent perennial plant endemic to the south eastern part of Southern Africa. 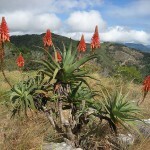 Aloe arborescens has adapted to many different habitats, its natural habitat usually consists of mountainous areas including rocky outcrops and exposed ridges. Its habitat can vary and is one of only a few species of aloe that is found growing from sea level up to the tops of mountains. 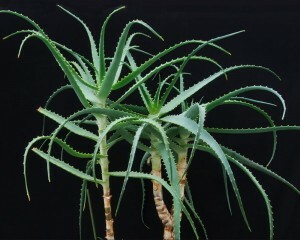 Description: Aloe arborescens can grow to 2m (6.5 feet) tall; only young plants are suitable for use indoors. The narrow, tooth-edged leaves which are 15-22cm (6-7 inch) long and 2cm (0.8 inch) wide, form a loose rosette on the end of a bare woody stem. Offsets normally appear around the base when plants are two or three years old. Red flowers may be produced at the top of a long branched stem. Houseplant care: Aloe arborescens is an easy to grow houseplant as long as the light requirements are met. Light: Bright light suits Aloe arborescens. They do well in full sunlight. 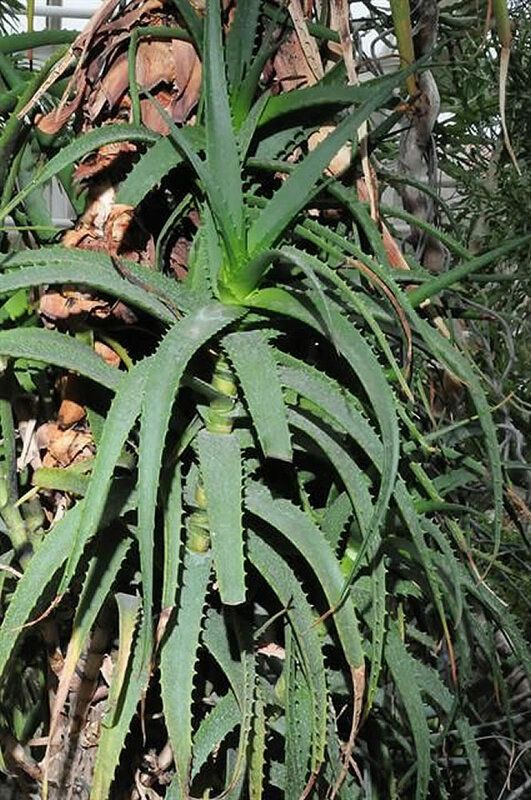 No Aloe will thrive if permanently placed at a distance from a window. 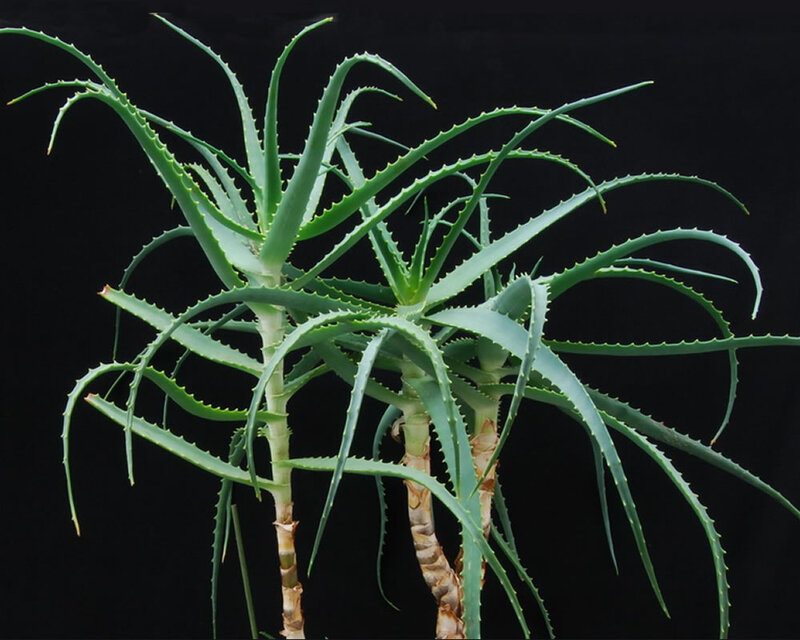 Temperature: Aloe arborescens grow well in normal room temperatures and are tolerant of dry air. To encourage flowering, however, it is best to give the plants a short winter rest at a temperature of no more that 10°C (50°F). Water: During the active growth period water plentifully as often as necessary to keep the potting mixture thoroughly moist. During the rest period water only enough to prevent the mixture from drying out. Potting and repotting: Use a soil based potting mixture. Aloe arborescens should be moved into one size larger pot every spring. When maximum convenient pot size has been reached, plants should be top-dressed with fresh potting mixture once a year. Propagation: Offsets can be taken from the base of the plant in early summer. These small new rosettes are often attached to the parent by a short underground stolon and may already have little roots, which should be retained for propagation purposes. Because very tiny offsets are hard to root, they should not be removed for planting until their leaves have begun to open into the characteristic rosette shape. Plants that have a rosette of leaves on a long stem are likely to produce additional small rosettes low down on the stem and these root more easily than the rosettes which are higher up. Offsets will root in two or three weeks in the standard potting mixture is some coarse sand is sprinkled at the base of the rosette to prevent rotting. Until offsets are well established, they should have bright light without direct sunlight and they should be watered sparingly, only enough to moisten the potting mixture, allowing the top two-thirds of the mixture to drying out between waterings. Melly bugs and root mealy bugs can be troublesome. The former hide deep in the crevices of the rosette foliage and the latter generally bury themselves in the roots, just below the surface of the potting mixture. Treatment: Use an insecticide soap or make one from dish detergent (free of perfumes and additives if it is possible) mixed in a week concentration with water and spay the plants. After treatment washing the plant is recommended. Alternatively, use an adequate pesticide. Repeat the treatment if necessary. 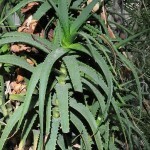 Uses: Grown in containers, Aloe arborescens make a remarkable houseplant or installed on porches, patios, decks, etc.